​For Economic Development Professionals and Staff at EDOs, ADDs, Chambers, and government economic development departments. When: October 30 and 31, 2017, 9 am - 4:30 pm. 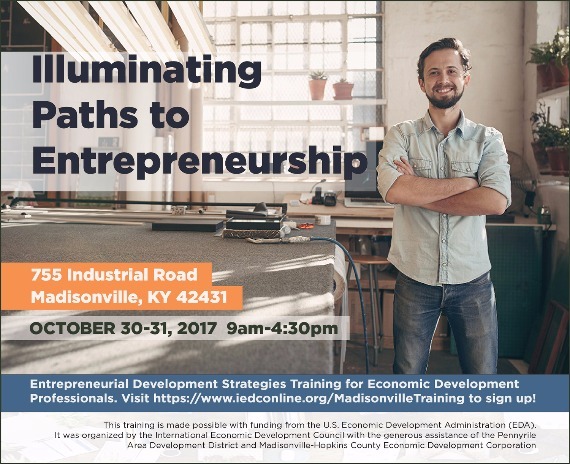 ​With the generous support of the U.S. Economic Development Administration, the International Economic Development Council is offering this free course to all economic development professionals in Western Kentucky. Be sure to take advantage of this valuable opportunity to learn more about crafting and promoting a healthy entrepreneurial ecosystem.